It’s been a while since our last blog but we finally managed to get back behind the laptop, providing you with a fresh installment of coffee news from Colombia. 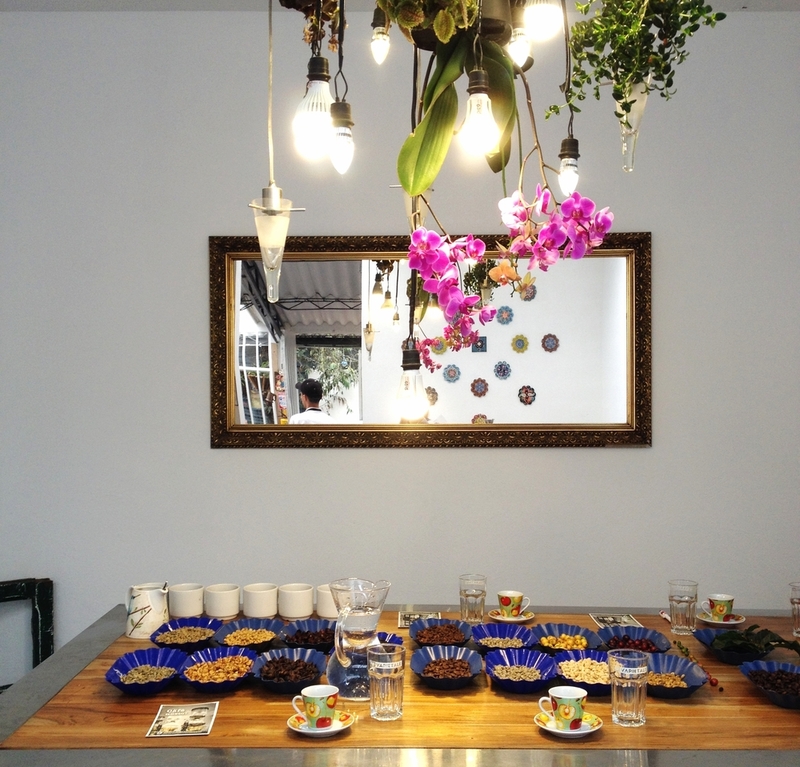 Last Saturday we participated in a three-hour tasting session at a new café in Bogota called Varietale. It’s located right next to the Javeriana and Distrital universities, meaning during the week it’s packed with students and professionals meeting for heated debate, coffee and cake in true Viennese café tradition. Besides the excellent single-origin coffees from across Colombia, we love the place for its stylish decoration, bright and airy spaces and relaxing garden out the back. Our tasting was led by expert baristas Jorge Andres Vegas and Sebastian Hernandez. First we were given a quick run-through of the history of coffee’s arrival in Colombia, thanks to Jesuit priests who introduced the bean via the Orinoco River around 1730. Then it was time to hone our taste buds for acids, salts, sugars, bitter and sour components by tasting a series of solutions and fruits. One fact that jumped out immediately: what you smell doesn’t necessarily translate into what you taste. Finally we moved onto the real thing, slurping our way through several different coffee varieties that are grown in Colombia, including Bourbon, Maragogype and Geisha, as well as beans roasted to different levels. Many Colombian coffees are known for their high acidity, although slower/longer roasting seems to reduce this. Perhaps most interestingly, Andres and Sebastian showed how small changes to your coffee preparation method can significantly improve how it tastes. Using a French Press for example, we experimented pouring a small amount of hot water onto the ground coffee and allowing this to sit for about one minute, before then adding the rest of the water for a further 3-4 minutes. The result was noticeably different from another pot made by adding all the water in one go. Varietale is owned by Abel Calderon and his sister, and was set up about a year ago in a former convent building in Bogota. (On one occasion while we were sitting there, the Sisters came in to take a look around. They seemed pleased with the transformation!) For those seeking a fun and informative afternoon, we can highly recommend this short tasting course!